Ryan Zimmerman thrust his right fist into the air in the bottom of the 9th inning as he rounded 1st Base. What was left of the largest crowd in Nationals Park History was on it's feet stomping in delight. 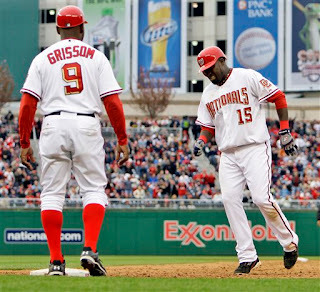 For the third time in this Opening Game of 2009 at Nationals Park, Our Washington Nationals had fought back offensively--countering their pitching and defensive woes. And with Adam Dunn and Elijah Dukes waiting on deck, The Perfect Closer of 2008 for The Philadelphia Phillies--Brad Lidge--looked mighty vulnerable--in fact, human. The Z-Man's blistering two run homer to the deepest reaches of centerfield at The South Capitol Street Ballpark had brought Washington's latest deficit back to one. On most night's 8 Is Enough, but today it was not. The Phillies had already plated nine. But who cared at that moment whether DC's team had yet to win a game this season? Dunn and Dukes had already slammed out Home Run Blows in their own rights earlier this dramatic day. Really, there was hope. Our Number 44 with a majestic two run shot to centerfield in the 7th off Philadelphia's Clay Condrey. And Our Number 34's in the bottom of the 5th off the Ancient Jamie Moyer. A solo shot ripped to the leftfield bullpen. I am telling you, no one swings a bat harder than Elijah Dukes. All power--combustible high octane only. What a threat that young man is. And everyone on hand knew that too. Not many of those continuing to stand on their feet roaring at Nationals Park would believe any other outcome was possible. Our Washington Nationals were going to come all the way back. You could just feel it. All game long, Washington had remained close, losing an early one run lead and then clawing back to tie The Defending Champions Twice. Yes, winless on the season--but in position to rebound mightily. Two Powerful Washington Bats making The Phillies sweat this one out. And so were their fans. This was good stuff. At least until Brad Lidge regained his momentary lost form and proceeded to throw slider after slider into the dirt, just off the plate. Dunn lasted five pitches before striking out. Dukes just four. Over anxious and wanting to succeed--both had over swung and had gotten themselves out. A deflating turnaround sitting the dejected masses back in their seats. What once was promising would end rather routinely moments later when Nick Johnson swung at the very first fastball The Phillies Closer had thrown since Our Number 11's Titanic Blast earlier in the 9th. A first swing chopper right to first base that Philadelphia's Ryan Howard fielded cleanly to end what would have been a momentus comeback. RallyTime!! which was necessary due to some very poor fielding, pitching and an interesting decision by Our Manager Manny Acta to let Saul Rivera face the always dangerous Ryan Howard in the top of the 7th. Daniel Cabrera, wearing Number 45 (now I thought he was Number 40? before) got the Home Opener start. He was his usual frustrating self. On top of his game one moment, then not finding the strike zone the next. But what made matters far worse were three brutal errors committed by two fielders behind him. Surprisingly, Anderson Hernandez (just off the Disabled List to replace the injured Willie Harris) couldn't find his glove on two consecutive ground balls. Cristian Guzman made a bad throw on a fielding play deep into the hole at short (but wasn't charged an error). And Adam Dunn displayed his short fallings in left, when he completely missed a one-hopper off the bat of Pedro Feliz in the 4th that set up The Phillies 4th run. You can score all the runs in the world, and Our Washington Nationals surely seem capable of doing just that at times--but if your defense can't make the routine play and your pitchers can't hit their locations--you are not going to win. Another case in point--the crucial moment of this game. stepping to the plate. On consecutive pitches, Our Number 52 plunks both Shane Victorino and Chase Utley. Rivera clearly had no command. So why leave him in the game with the powerful Ryan Howard stepping to the plate? Two potential situational lefties where still available in our bullpen. Rivera had not pitched well the other night and he wasn't doing so again this afternoon. As everyone knows, Howard can slug with the best in the game, but he's proven to be vulnerable to lefties--especially those that get him out swinging high and inside. Wil Ledezma and Joe Beimel were available out of the bullpen--and can do just that. But Our Manager Manny Acta chose to stay with Saul. Three Batters and five pitches into his latest appearance, Our Number 52 had given up the decisive blow of the game. Ryan Howard launching an away fastball over the left centerfield wall and into the Red Porch Seats for what turned out to be the final turning point. The Former National League MVP and Philadelphia Single Season Home Run Champion had done his damage in The Nation's Capital once again. A tie ball game that quickly became a three run deficit and subsequently pushed to four when Raul Ibanez also homered off Rivera. The Phillies scored an important insurance run in the 8th on a Eric Brunlett double, Jimmy Rollins grounder to advance Bruntlett to third--and eventual sacrifice fly stroked by Victorino. Yes, Our Washington Nationals fought back. Yes, Our Washington Nationals can slam the ball with the best of them. But on this Home Opening Day at Nationals Park they found out that 8 Is Not Enough--they needed more--especially when their pitching and defense let them down. Final Score from a packed house of 40,386 on South Capitol Street--mostly Nationals Fans too. 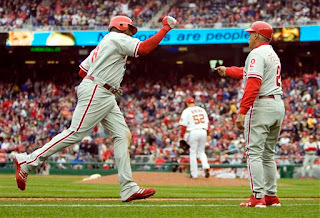 We didn't witness any bad behavior on part of The Phillies Infamous Legions. And we are here to tell you--that ballpark was jammed with people--The Philadelphia Phillies 9 and Our Washington Nationals 8. A winless week of baseball in early April 2009 for Washington has continued at the hands of our ball club simply working with mismatched parts. Every time they do something right, something else go wrong. Today was a very exciting day to be at Nationals Park, but frustrating to see Our Washington Nationals really beat themselves in a game if played routinely--they should have won. After striking out Ryan Howard to begin the top of the 2nd, Cabrera just sort of lost it after a single by Jayson Werth when Anderson Hernandez booted a sure inning ending double play grounder slapped by Raul Ibanez. An all safe call that found Daniel proceeding to walk both Pedro Feliz and Chris Coste to plate Philadelphia's first run. The losing of control that cost him one additional run when the weak hitting Phillies Pitcher Jamie Moyer slapped a routine fly ball to medium/short leftfield for out number two. One of those--no way the tall and slow Ibanez is going to attempt to score from third on a sacrifice fly. At least until you realize every third base coach in The National League is going to test Adam Dunn's throwing arm. 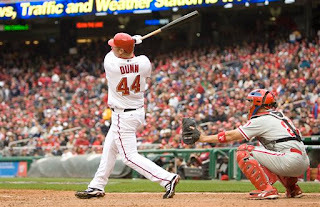 He is what he is--Dunn. A prolific offensive threat with a defensive downside. Ibanez scored Philadelphia's second run rather easily. It wasn't as close as it seemed. Daniel Cabrera completed five full innings and was only charged one earned run in the four he allowed--thanks to the defensive mishaps behind him. He threw 94 pitches, 55 for strikes. He was Daniel Cabrera--all over the place--but he deserved better this day. It was also odd that when Julian Tavarez replaced Cabrera for the 6th--Manny Acta replaced Tavarez with Mike Hinckley after Julian had recorded the first two outs in that frame. Jimmy Rollins was coming up. The Former NL MVP is a switch hitter. Whether they turned Rollins around or not to hit--it wouldn't matter. So why that change at that point? The switch seemed sort of pointless--unless Rollins has a good history facing Julian Tavarez. Just odd. Until he hurt himself swinging and charging out of the batters box in the bottom of the 9th, "The Guz" was having a career day at the plate. 5 hits in 5 plate appearances, including a terrific hustling infield single slapped to Jimmy Rollins playing short for The Phillies. No one runs harder on the bases than Cristian Guzman. Our Number 15 is a competitor. He never gives up and hopefully his leg injury is not as bad as it looked. Guzman limping off the field, replaced by Alberto Gonzalez moments before Ryan Zimmerman hit his fabulous homer to centerfield. Cristian scoring two runs and knocking in two--finishing the day batting a robust early season average of .515. The Heart of Washington's Lineup--Zimmerman, Dunn and Dukes with two RBI's apiece, combining for five hits (three of which were home runs). In the top of the 5th, Raul Ibanez got ahold of a Cabrera changeup and rocket launched the baseball to dead centerfield. Lofted so high, the wind took control and it carried deep to the wall near the 402 mark. Lastings Milledge drifted back, then drifted back some more, then finally realized the baseball was going to hit the Green Wall. Jumping up and smacking the unforgiving wall hard--Milledge made a nice leaping catch to retire Ibanez and The Phillies in the 5th. But as nice as that effort was, it was nothing compared to Elijah Dukes defensive gem one out earlier. Ryan Howard ripped a Cabrera changeup down the right field line--near Washington's Bullpen. With virtually no time to react and the ball fast approaching--Dukes swiftly moved to his left, stucked out his left hand, his glove hand and SNOWCONED the baseball in the webbing of his glove. The Defensive Play of This Game that found, not only Washington's Fans Cheering, but his bullpen mates applauding robustly from behind the protective screen. It was a very nice defensive gem. Only catlike reflexes catch that screaming baseball. Team President Stan Kasten informed The African Queen and I that the attendance total of 40,386 is an actual sellout, because Our Washington Nationals DO NOT count the freebies handed out to family, friends, groups, etc. Also, we were approached by a few fans concerned over the fact that The NatsExpress was not operating at 12:30PM from RFK Stadium's Lot 8 this day. A fact that found some patrons walking over to the Stadium-Armory Metro to get to Nationals Park. Mr. Kasten reminded us that NatsExpress only operates beginning 90 Minutes before every home game. Today, that meant the free shuttle service started at approximately 1:30PM. Just passing along the information. Also, there will be a change to The Topps Starting Lineup Baseball Card display on the side of Garage B in Centerfield Plaza. Currently, those players depicted on the wall--are shown by position--not really by batting order. Soon, Washington's Actual Starting Batting Order will represented. Of course--what would Opening Day be without seeing our friends again. And "The Usual Suspects" were handing out Today's Opening Day Giveaway. A very nice faded Red Curly "W" Cap sponsored by MASN. Love The Expanded Inside Pitch Free Program--back again for a second year at Nationals Park. A few more articles, player stats and Two Free Baseball Cards inside. Today's First Edition carrying WTOP Cards of Austin Kearns and Ronnie Belliard--complete with career stats on the back. Nice touch. We noticed a few kids already taking them out of The Inside Pitch Program to look at and enjoy. Also we liked the slightly changed graphics on The HDTV Screen when Our Players stepped to the plate. This year, the script Curly "W" Washington Logo flying in the background of all pictures & stats of each batter. Different and well done. No The President Of The United States DID NOT post up for The Home Opener. Instead Five Service Members of Our Armed Forces were given the honor of throwing out simultaneous first pitches. 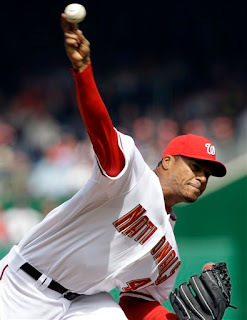 For the record--Daniel Cabrera's first pitch of 2009 at Nationals Park--was a ball. The First Official Presidents Race of 2009 featured Tom heading out of the centerfield gate alone. Eventually, Abe & George joined the race. But Teddy distracted Tom near the home stretch and eventually that weird cat from last year returned to Nationals Park and tackled Tom--allowing Abe to garner Victory Number One. 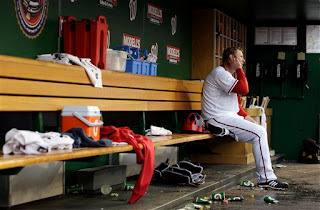 Finally--there was a very sad moment at Nationals Park today. The Philadelphia Phillies Great Broadcaster, Harry Kalas fell ill while working in the visiting broadcast booth at The South Capitol Street Ballpark. Subsequently, he passed away at George Washington University Hospital. At one point, Our Washington Nationals nearly cancelled today's game. Apparently, The Phillies wanted to play in Harry Kalas' honor. There was a moment of silence for Harry Kalas before today's game--as well as for Nick Adenhart--The Los Angeles Angels young pitcher so tragically killed in Fullerton, California last week along with two other friends. The deaths, the result of a hit and run driver. A wild, tiring opening day filled with frustrating moments. It's clearly going to be a rough year, but it was great to be out in that packed house on a weekday afternoon, feeling the energy of the new season. Did you catch the pre-game piece on the transformation of your Best Friend? Interesting. I really liked the hat, nice and worn in but it should have said "Opening Day 2009" to set it apart. Simple things, simple things. Just like on the field as you pointed out, if the Nats had taken care of the simple things we would have had a different outcome. Yeah, another loss but I had a great time. Somehow it was much more bearable than the 5-2, 6-1 losses of last year. We have some real hitters now, but the pitching has fallen off a cliff from last year. A fun moment was Ryan Z's last bat. A bunch of us in section 308 were yelling for him to shorten his swing and just get a base hit (thinking Dunn or Dukes would hit the long ball). But when he clobbered it, clearly heading over the fence, I could only cry "do it your way then". I started reading this blog, oh yesterday, and I want to say that I was very moved by the Nationals tribute to Harry K., and by the respect for him shown by all of the Nats fans. There was much good about today's opener: the tributes to the young pitcher and the old announcer really brought home the promise and the tradition of the Nation's game. The web gem by Dukes and the hilarious catches by Milledge; Guz going 5-5 raising his average to .500 range; Z-Man with another 9th inning shot in the Opener; Dunn hitting a blast; and Dukes lashing one one-handed and the crowd starting the DU-Kes cheer for him; a record-setting crowd adorned in nice free W caps; and decent weather. Now for the bad: Manny Acta lost this game for the team. He started AHernandez when AGonzalez was ready and had already played a game at second - the rusty Hernandez really got us off to a terrible start - the seventh game in which the Nats fielding has looked worse than 2008 - a feat many would have considered an impossibility. The wild pitches, passed balls, boots in the field, not covering bases, ridiculous routes to the ball in the outfield, normal basehits to left now almost regularly a double, hit batsmen, errant throws from shortstop and third to first NEEDS SHORING UP! Acta MUST put the best defensive line-up out there for now: this means, and I have been saying this all year Dukes in center; Kearns or Williamham in right; and a HEALTHY AHernandez or AGonzalez at second every day. Boz is right: Milledge to Syracuse - in Florida, he was openly mocking Cabrera at the plate while on the bench - Johnson got up and moved away from him, for good reason. Small wonder the Mets found him to be a huge irritation - he is irritating. Who would select Chad Johnson's number for baseball, but someone asking for it! Manny has three lefties in the bullpen this year, as said, so as to USE against the NL Elites. He blew it. Two hit batsmen and the Big Guy approaching the plate - and every experienced manager makes the move. He is just nailed to his seat in the dugout. There is simply NO ENERGY coming out of this guy - way too stoical. Over compensating, I suspect, for being such a young manager, that he wants to appear cerebral. Like BowBow, whom we all knew that it was only a matter of time, Acta's clock is ticking. He is probably not destined to make it through this season. Riggleman is there for a reason - he readily slots in. It would not change a disasterous season, nor give us a pitching staff: but, it cleans the house a bit more. Trust in the wonder of Opening Day. All Sentimental. And really gooey statues!!!!! In your pre-season food preview Kasten was touting how much better service would be at the concession stands with the hiring of Levy Restaurants. He noted the new pizza on the club level was the best he ever tasted. Must be because when I went to get some in the 3rd INNING all the pizzas were in the oven and the person working the register told me I could WAIT 15-20minutes until the next batch came out. They had one guy making pizzas and eight people standing around talking and doing nothing because they had nothing to sell. Here's a concept. As you take one cooked pizza out of the oven, put another one in. At another concession stand on the Club Level they advertised garlic fries with chili and Old Bay seasoning on them. When I ordered mine there were some that obviously had been sitting under the heat lamp for 20 minutes and were all dried out. When I asked for a fresh batch I was told I had to take the dried out ones!! I just walked away, of course after wasting 15 minutes waiting in line. So much for customer service. Ok Stan, maybe you can't wave a magic wand and fix what we see on the field. But every year we are promised better service at the concession stands when you hire yet another food management company and every year is just as bad as the last. I am tired of excuses like "we are still working the bugs out, it will get better later in the season, etc." I've had season's tickets all five years and am paying a premium price for Club Level seats. I don't see why the higher level of service that I'd expect for Club Level should be any different on Opening Day than what I get in June. The price is the same. Why should my game day experience depend on how long it takes the people you hire to figure out how to do their jobs? "Mr. Kasten reminded us that NatsExpress only operates beginning 90 Minutes before every home game"
Last year, the buses started from RFK around 2 hours prior to every home game. Why change now? "The Nats Express will operate continuously from at least an hour and a half before game time through an hour and a half after the last inning." note that it says "at least an hour and a half before game time." This means to me that they have the option of starting the buses earlier than 90 minutes before game time. So my question to you to ask to Stan (since you are tight with him), if the gates were opening up at 12:30, why not start the buses so that they would start to arrive around that same time? I mean, this was OPENING DAY after all! All I kept hearing about was that fans should come early to OPENING DAY and check out all the fun. Well, I expected the buses to run like they did last year. But no. Instead, I ended up driving to the ballpark and paying $20 to park ($20 less than I would have paid inside the stadium). I understand that cutbacks are inevitable in this current economic climate, but for goodness sakes, this was OPENING DAY! Most of the Phillies fans near us were fantastic. However, a young (20-something) guy was in the bag and getting more and more offensive by the 3rd inning, yet he was continually being served beer. In fact, he left during the middle of the 7th and returned with TWO beers in his hands. Needless to say, his behavior deteriorated even more. When the profanity level increased, someone finally went to an usher and had him removed, but it shouldn't have been allowed to get that far. A question for Stan: Why are obviously intoxicated fans still allowed to purchase alcohol? I thought there was a law against doing that. Parents took their children and left because of this guy. Do you think they'll be back? I doubt it. Another note about the new trappings of National Park. Each of the gooey statues has three arms and five bats for the batters, five balls for the hurler - the bronze "clay" under feet and inbetween bat swings, arms, balls, etc. is designed to depict the motion, I suppose. Were this clay, like the JFK head at the Kennedy Center, it might work - but the statues themselves are traditional and the motion is impressionistic, and it is a gooey mess. Walter Johnson's descriptor is on the right side of the pedestal, whereas the ones for Howard and Gibson are in front - adds to the haphazardness of Monuments Gallery. What do we do in the future should Nats have a Hall of Fame type and we want to erect a fourth - if another style, then more of a cluttered look. I urged 30 team pennants to be placed on flag poles at Nationals Park: they are now, but they are not visible from anyplace, really, either inside or outside the stadium: didn't anyone figure that out BEFORE they all went up. If the roof is not the right place, then they could have been placed up to the left of the Red Loft on flagpoles, visible as you come in the Centerfield Plaza. Trust in the Lerners' Taste. All in the mouth of the beholder. For those of you who count your roll over minutes on your cell phone, ponder this. Yes, our boys are 0-7 and they staged a valiant comeback attempt yesterday that fell just short. But remember we finished 2008 1-9 in our last 10 games. So that makes us 1-16 if you carry it over the two seasons. Yikes! Want more? We were 3-14 our last 17 games in 2008. So that makes us 3-21 our last 24 games. Were this clay, like the JFK head at the Kennedy Center, it might work - but the statues themselves are traditional and the motion is impressionistic, and it is a gooey mess. This pretty much echoes my feelings after seeing the statues in person. They're not as bad as the pictures make them look, but the mix of impressionistic and realistic just doesn't work. Do one or do the other, but don't mix them. In fact, if the gooey stuff was just removed, leaving the extra arms and bats intact, I think the feeling of motion would still be there, and it actually might be quite effective. And SenatorNat, as I was sitting in my upper deck seat near the press box yesterday, there's one thing I was struck by - there needs to be something in that spot where the giant baseball was supposed to go. A Capitol dome, a mock-up of the White House, even a giant baseball. Something iconic. As I watched the first game from Citi Field on TV last night, I was struck by how similar their basic design is to Nationals Park. The difference is the trim touches around their ballpark that evoke either NYC or baseball, of which we lack. For instance in their concession area under the scoreboard, there is NYC skyline trim across the top of the buildings containing the concession stands. We have nothing like that. It would be good to see something evoking Washington in front of you while standing in line at Five Guys! A couple more anecdotes from friends in various places around the stadium: One friend went to buy beer. When the poor cashier kept overcharging (hard to imagine how) she finally gave my friend a free beer to go with the overcharge! Now that's service! Another friend got in a long hot dog line only to discover at the end . . . no hot dogs! As for me, I brought a peanut butter sandwich but went thirsty. The lines were way too long.